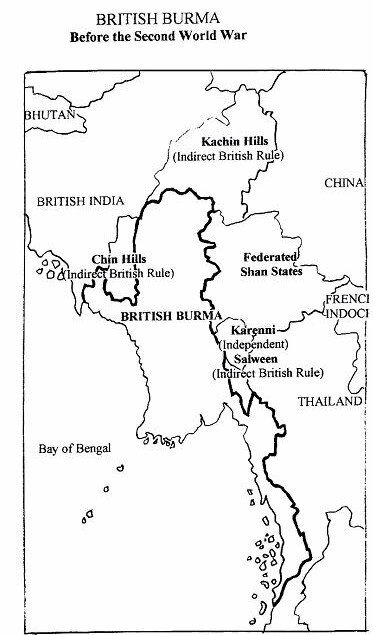 1886 - Britain annexes the Burman Kingdom (including Arakan and Mon states). Karenni (Kayah) states are recognised as sovereign states. The Shan States become a British protectorate – the Federated Shan States. The Chin & Kachin Hills and the Salween District (Karen State) are ruled indirectly by the British as Frontier Areas. The ethnic nationalities in Burma, such as the Arakan, Chin, Kachin, Karen, Karenni, Mon and Shan have their own separate homelands and military and political organisations. There are also minority ethnic groups in each of the seven ethnic states mentioned above. 1930s - The campaign for Burman independence is born. 1940s - Burman nationalists are trained by Japan with an understanding that the Japanese will help Burma gain independence from the British. 1942 - Japan invades and occupies Burma. Chin, Kachin, Karen and Shans remain loyal to the British and fight the Japanese and Burman Nationalists. 1944 - After it becomes clear that Japan has no interest in Burma's independence, Burman nationalists begin to fight with Britain and its Allies. Japan is defeated and forced out of Burma. 1947 - Bogyoke Aung San, Burma's ethnic leaders and the British sign the Panglong Agreement to form the Union of Burma. 1948 - Burma gains independence from Britain and becomes the Union of Burma with U Nu as Prime Minister. 1960 - The Federal movement to legally amend the union constitution begins to emerge. 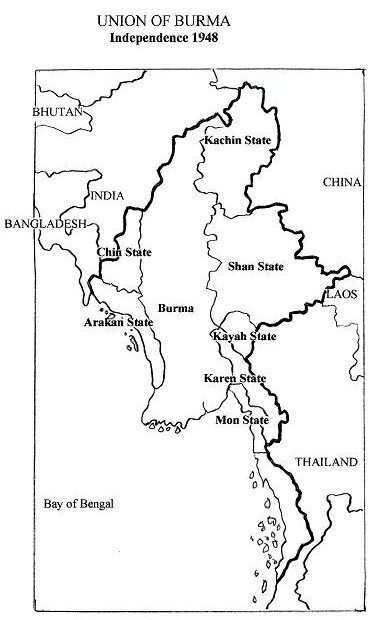 1949 - Civil war breaks out in Arakan, Karen, Karenni and Mon states. Six months before Burma gained full independence from Britain, Aung Sang was assassinated by a gang of paramilitaries of former prime minister U Saw. Though Burma did go on to gain independence, the process of reconciliation between Burma's different ethnic leaders was put on hold. Burma’s early years after independence were turbulent. The first and most serious threat to the nation was the uprising of the Communist Party of Burma, which threw Burma into civil war only eight months after it had gained independence. During this period of instability, even the Burma army mutinied and U Nu’s government survived only because the Chin, Kachin and Karen Rifles remained staunchly loyal. The government at that time was an ethnic mix: the President was Shan, the Prime Minister was Bama, the Commander-in-Chief and the Air Force Chief were Karen. It was the first grand experiment to create an inclusive and just multi-ethnic nation. 1962 - General Ne Win leads the military coup ‘to prevent the disintegration of the nation’ and takes power of Burma. Civil war breaks out in Kachin, Chin, & Shan States. 1988 - The People’s Power Movement for Democracy is born. 1990 - General Elections take place and Aung San Suu Kyi's party, the National League for Democracy (NLD) wins 82% of seats, the United Nationalities League for Democracy (UNLD) wins 15% of seats, and the military-backed National Unity Party (NUP) wins just 2% of seats. In 1962, General Ne Win - a former prime minister of Burma - seized power from the democratic government of U Nu. For 48 years, until 2010, Burma was ruled by a succession of military dictatorships which ruthlessly suppressed individual and political freedoms in the country and outlawed all forms of political expression. The Burma Army of 1962 was modeled on the 1930’s fascist movement and its policies left no room for ethnic diversity or political dissent. The army modeled its style of ruling the country on previous Burmese kingdoms, such as that of King Anaw-ratha and King Bayin-naung, who saw the other ethnic states as territories ot be conquered. When General Ne Win seized power in 1962, he re-wrote history. He began a process of Burmanisation which involved purging non-Bamas from public life. He suppressed all political dissent, making it impossible to redress wrongs in any way except through armed struggle. Those who did not take up arms had to live like second-class citizens, hide out in the jungle, become refugees or seek a new life abroad. QUASI-CIVILIAN GOVERNMENT - A NEW BEGINNING? 2008 - A referendum approves a new military-backed constitution. 2010 - General elections are held. A civilian government is inaugurated. In the 2010 General Election, the ethnic parties won enough seats to make their voices heard and to begin to exert influence in their home states and at the national level. In his inaugural speech, President Thein Sein talked of the “the hell of untold miseries” suffered by the people because of the decades of armed conflicts and “the dogmatism, sectarian strife and racism” causing the conflicts. He made it his government’s top priority to build a “peaceful, modern and developed“ nation. Since then, ethnic armed groups and the Myanmar government have entered into ceasefire discussion and it is hoped that a union level ceasefire will be signed soon. But ceasefires are not enough. The ethnic nationalities want to have an equal share in the process of nation-building. A national dialogue is being negotiated and developed to ensure the aspirations and concerns of the ethnic nationalities can be heard and that long lasting solutions can be found. * Note: Burma is today officially known as Myanmar. The democracy movement does not accept this name because the it was changed by its military rulers without consultation with the people of Burma. The military claims Myanmar is more inclusive than Burma, which represents only the majority Burma ethnicity. In reality, Burma and Myanmar are the same and are used interchangeably. 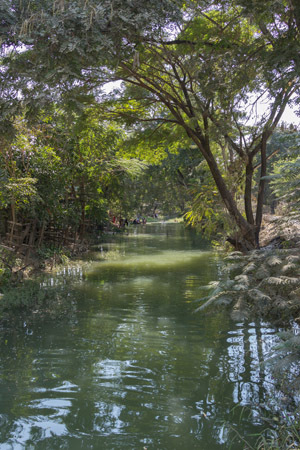 Burma is a more colloquial form and Myanmar more literary.